First of all, we have to know what Windows 10 timeline is all about. This Timeline we are talking about is part of Windows 10’s Task View which shows a history of activities you’ve performed and can even synchronize activities across your computer. You can then easily pick up where you left off. Timeline feature is part of Windows 10’s Spring Creators Update which can also work with mobile apps if you sign into but if you want to sign-in, it requires you to have a Microsoft account, so you might see a Word document you opened on your iPhone or Android phone appear in the computer's timeline. The Nearby Share feature is only available for now if you’re part of the Windows 10 Insider Preview program. The feature will start rolling out to the public when the Spring Creators Update arrives, So it is expected to be available second week of April. The first thing we have to know in making use of Windows 10's Timeline is to know how to access the timeline. >>Click the “Task View” icon to the right of the Cortana box on your taskbar. For those people that are unable to find the icon, you have probably hidden it in the past so you can right-click your taskbar and click “Show Task View Button” to re-enable it. Another trick to open Task View is by pressing Windows+Tab on your keyboard. The Timeline appears below your currently open windows in the Task View interface so you may need to scroll down to see it. The scroll bar at the right side of the screen lets you to scroll back through previous days. >>Scroll down through the timeline to view activities you’ve performed recently. You will also see activities associated with modern Universal Windows Platform (UWP) Store apps, including web pages you’ve viewed in Microsoft Edge and articles you have looked at in applications like the News app included with Windows 10. >>Click or tap an activity to resume it. Windows opens the file or returns to the web page, article, or whatever else you were looking at. Activities you’ve performed on previous days are grouped to make this interface easier to skim. Click “See All Activities” to see them all. 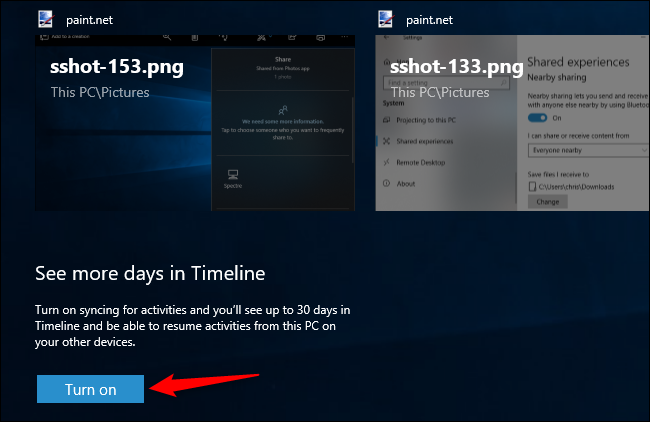 Once you follow this steps well, you are done in accessing you timeline on windows 10. The second thing you have to know in making use of Windows 10's timeline is to synchronize your timeline. How to Synchronize Your Timeline Across Your Computer. By default, the timeline is on but it doesn’t sync anything to the cloud unless you let it. If you tell Windows to sync your data from a computer to the cloud, you will see those activities on any other computer you sign into with that you same Microsoft account. You don’t have to enable this feature on each computer to do this. For instance, you could enable syncing on your desktop and leave it disabled on your laptop. You had see your desktop’s activities in the Timeline on your laptop, but you wouldn’t see your laptop’s activities in the Timeline on your desktop but if you enable syncing on your Laptop also, you will be able to see the activities there also. >>Scroll to the bottom of the Timeline and click the “Turn On” button under the “See More Days in Timeline” section. 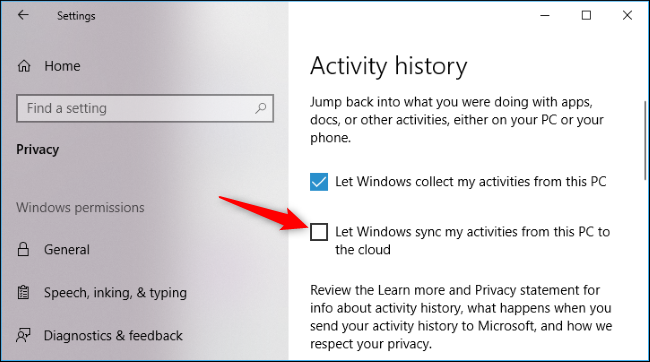 Another method to do that is to go to Settings >>Privacy >>Activity History and enable the “Let Windows sync my activities from this PC to the cloud” option. Once you are done with that, move to the third thing to do in making use of the Windows 10's timeline which is disabling the timeline. If you tired of using the Timeline feature or you don't want to make use of it again. >>Just go to the Settings, move to >>Privacy >> Activity History and disable the “Let Windows collect my activities from this PC” option then erase the contents of your Timeline. >>Once you have done that, set any Microsoft accounts that appear under “Show activities from accounts” to “Off” and then click the “Clear” button. If you want to really make use of timeline, the apps you use will have to add support for it so it's not clear how many apps will support the timeline and Microsoft Graph API. So if you are the kind of person that want to make use of the windows 10's Timeline effectively, you have to follow this 3 guides I gave you above.